Ok, yes, my children like tv programmes. And yes, maybe the tv comes in useful as a distraction. When the children are grouchy and/ or not in the mood for much. When I need to make a call, or sort some housework. And, sometimes it's easy to grow tired of regular programmes. So, I was intrigued when Squeaks sarted singing "Olly the little white van..." practically on a loop. And it turns out it's something which all three children are now obsessed with. Squeaks was over the moon when Olly's DVD arrived for her and the boys to review. As a fan of Justin Fletcher, I wonder if that's what drew Squeaks in, but between all three they love all the vehicles and all of Olly's friends. I like the fact episodes are short, around five minutes, which means it's enough time to get a few chores done, but not too much tv and does keep the attention span of the boys at two years old. I also like the fact the episodes focus on friendship, at a time when all three are establishing their personalities and boundaries, it's great to have messages reinforced. And, I;m really excited that there will be books to accompany the dvd out soon- sticker books will be great for Squeaks, chunky books would suit the boys. The DVD currently retails for £7.99 at a range of retailers including Sainsbury's. 4. 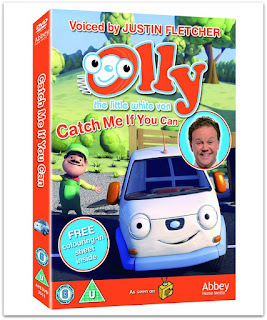 One entrant shall win a Olly the Little White Van DVD. Disclaimer: I received a copy of the dvd for the purposes of this review. All opinions expressed are my own. Not really a "theme tune" per se but, the 'Hot Dog, Hot Dog, Hot Diggity dog' one from Mickey Mouse Clubhouse. Grrr it will be in there all night now!